A Coventry City supporter invaded the pitch and shouted at several players before being escorted off. 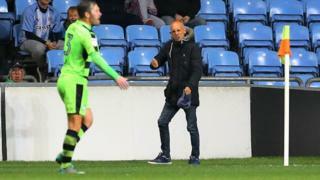 The man managed to walk on while the ball was in play during stoppage time in the Sky Blues' 1-0 home defeat against Forest Green Rovers on Tuesday. He shouted at his team's players before being escorted off the pitch by captain Michael Doyle and then a steward. West Midlands Police said officers had taken his details and he would be interviewed "in due course". It is a criminal offence to enter the field of play and the club said it would be reviewing its existing procedures in place on match days. In a statement, a force spokesman said a man was ejected by stewards for encroaching on to the pitch.